The 1st Chef – Kinshichi was trained under the founder of Edomae sushi, Hanaya Yohe, with the style of the “Senju Miyako Sushi” established Bentenyama Miyako Sushi under the bell tower of Kinryusan Asakusa Sensoji Temple in Asakusa in Keiō 2 ( 1866 ). 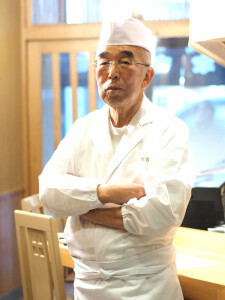 The 3rd Chef – Takesaburo celebrates 50th anniversary to write a Japanese poem, ” 美（み）どり濃き　家（や）なぎ寿く　古（こ）としかな “, and we are following it truely. We sincerely thank our clients and to do our work with the meaning of this Japanese poem. At that time, it was popular with a wordplay – Combining the original hiragana initial character of 5.7.5. ※ original hiragana character of ” や(ya) ” is the “也(also)” and is also the “家(home)” beautifully. 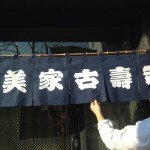 Since then , we have been working in this area as Tokyo Asakusa Bentenyama Miyako Sushi. We take good balance with vinegared rice, revised Sushi Dane, fresh wasabi and boiled japanese soy sauce to ensure maximum flavor of sushi, which follows the traditions of Edomae Sushi. 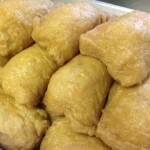 We keep using the traditional cooking methods: Nikiri, Tsume, Zuke, Sujime, Konbushime and etc. Catch the fresh fish in Edo Bay ( Tokyo Bay ) to make = Edo Bay production also exists, but Edomae Sushi was founded by Hanaya Yohe referenced with Kansai’s Osaka Sushi in 1827 Edo period. If grasping form of different sushi species of different sushi shop are put on the sushi rice , working of sushi species. They are all considered as Edomae Sushi style, and because of Edo period, called Edo era theory. I was born in (Showa 18 years) Asakusa 1943. I wanted to become a sushi chef since childhood. After graduation in Rikkyo University , I learned from the 4th Chef – Eichi Uchida. I was born in Asakusa 1974. 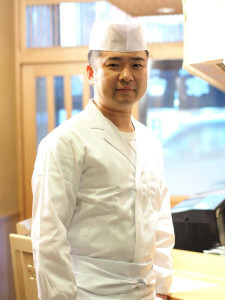 After graduation in local junior high school, I began the apprenticeship in Bentenyama Miyako Sushi in 1989 (first year of Heisei). Under the serious training of the 4th Chef and education of the 5th Chef, I became the 6th Chef in 2013 November. Eldest daughter of the 5th Chef – Tadashi Uchida. Training from 1999. After the death of the 5th Okami – Takako Uchida in 2007, she became the 6th Okami in 2008.